This summer we took a sunny drive to The Pickering Markets for the first time. This large building is situated just east of Toronto off highway 401, and encompasses a farmer’s market, flea market, food court and antique market. There’s plenty of free parking and multiple entrances so it’s easy to navigate. We didn’t spend much time in the flea market but headed straight to the antique section that anchors one end of the building. This is home to the Roadshow Antiques South location. 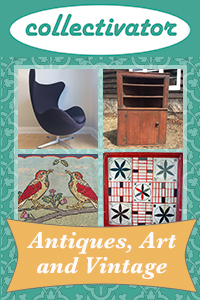 It’s a smaller sister market to the Roadshow Antiques North market in Innisfil Ontario. I’ve never been to the other location, but based on the website it appears quite similar. The Roadshow Antiques market is sectioned off into aisles and most of the booths are filled with items. I’d say only 5 – 10% of the booths were either unoccupied or very under stocked. The staff were friendly and I had a few people ask me if I needed help finding anything. It was also easy to simply roam the booths without feeling watched or rushed. For convenience the front cash has cubbies so they can hold your items while you browse. In terms of general quality of stock, I’d say it’s a mixed bag. I had no problem finding cool vintage items at fair prices, and a truly great selection of Pez (more on that later). However if you’re looking for strictly older antiques or furniture you may be disappointed. This market weighs more towards collectibles and nostalgia of vintage (or newer) age. There were a few booths featuring vintage jewelry and fashion accessories, toys and advertising. Some dealers specialized in popular collectibles like cameras and records. There was some good antique and vintage furniture scattered throughout, but the emphasis was on smalls. The Roadshow Antiques market is not going to wow you with every booth, but with over 150 dealers it has something for almost everyone. If you’re looking for classic collectible items like bottles, tins or china you’re in luck. Of particular interest to me were a few stalls full of classic vintage kitchenware. There was diner styled plates, glasses, cake stands, and Pyrex at good prices. I even found a small Tiki display and picked up a new mug for my collection. Speaking of Tiki, if you’re the type of person who finds kitcsh irresistible, there were plenty of “bad art” paintings, cutesy 1950s figurines and odd decor to catch your eye. Finally, as I mentioned above, there was Pez. So much Pez. I was in the last aisle of the market, ready to pay and leave, when I turned to see a towering Peter Pez display filled with older dispensers. I literally gasped like a Southern lady with the vapors. If you’re a Pez collector this is a GREAT place to go. The Pez dealer, Darlene, was there and we had a lovely conversation about her collection (some of which can be found on her website Pezopedia). She also sells Lego minifigs, Hot Wheel cars and other collectible toys. In the end, I think most people would enjoy checking out the deals at the Roadshow Antiques market. Many of the booths had sales on all regularly priced items, and I imagine stock gets replenished quite often. The rest of the mall offers a food court (the Italian and Mexican food was good), a large section of discounted toiletries and clothes, as well as a great British booth with cheap tea and crisps. We enjoyed spending a few hours comfortably browsing and we left with a bag of interesting items. I look forward to visiting The Pickering Markets again. This article is a fun read, and with lots of great photographs it gives you a good idea of what you will find at the Roadshow Antiques South Market. Based on this report, I want to check it out one day when I am in the area. Most helpful.